Arched or straight eyebrows? What looks better in your opinion? Hmm, that really comes down to preference. Arched eyebrows come off as "hotter" and more sexual to me, and straight eyebrows come off as more natural and less overtly sexual. So I think what a guy might like better would be highly dependent upon his taste in women. Give straight eyebrows a spin and see if you like it, anyone else's opinion be damned. You can always let it grow back to what's natural for you. Heck, I shaved my arms once just to see if I'd like it better without the hair (not doing that again, lol). I like straight one. To be honest whichever is less touched and natural on you, is the best for you. If you have naturally arched one, great. If you have naturally straight one, that is great too. More natural, more better. mine are naturally arched, but I think I look angrier because of the arch.. so I was thinking of growing/plucking them straighter, but I'm scared I might look funny since I'm so used to the arched eyebrows. Opinions on her outfit? Do you ever feel ugly and unattractive? Denim bikinis, Yes or No? What is ideal height for a woman in man’s opinion? What fashion trend or hairstyle did you wear at one time, that you now seriously regret? For the girl in the pic, I'd say straight. The arched ones make her look kind of mean. Some people look good with arched and some with straight, but generally I think slightly arched would be the safest choice. Yeah, that's what I think too.. I wonder if there are girls who don't look mean with arched eyebrows.. I think they always look (a bit) mean to me. Yeah, straighter eyebrows make you look nicer. I used to follow my natural arch because people always say to remove hairs only on the bottom part of your brows, but then I thought I looked kind of mean with them when I saw old pictures of me, so I tried to take some parts off the top and remove the 'pointy' part. would you say one's natural eyebrow shape is always most flattering for one' face shape? Arched looks better for this girl, but for most girls, the arch is overemphasized, and therefore it looks silly. If there is a proper arch, it is this one. do you think she looks mean if she doesn't smile? As far as what looks better, i think it depends on the person and what their facial features look like. I prefer straight one (with some subtle natural arch). But it would also depend on the shape of the face. 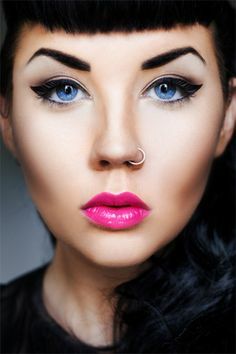 For example, Round face look better with arched brows and oval face can go with straight. I like the straighter eyebrows, they both look great, however, the arched eyebrows seem very challenging and a little less friendly, very mysterious and attractive, but not what I prefer. natural always looks best. the arched eyebrows make people seem as if they're giving you a quizical look. like they're forever confused. Her eyebrows are naturally arched that way though (like mine)... does it look best in that case? yes. the sculpted one are noticably made that way. They both look fine, but I couldn't imagine the second girls eyebrow on the first girl. What? ! ? they look different though! I think it depends on the person. Some people can pull off both like she can. I think in the first picture she looks hotter but in the second one she looks cute. I noticed for myself I look better with a slight arch. I am not that pretty, so I do what I can to make myself look better. I've noticed that eyebrows definitely can make a difference for a person. I've noticed a difference with looking at pictures of myself. For some reason with straighter and thicker brows my face looks chubbier. With thinner and arched it looks thinner. It's weird how they can really make a difference. as for her.. she had thick and straight before, but I don't suits her.. the thin and straight looks better on her. Whichever fits your face more, just keep it natural looking, don't paint it on, or overpluck or anything like that. Big turnoff for me. both look fine. a slight arch is all you need anyways in my opinion. Then it's just ridiculous and doesn't do too much for the girls features. Depends on the face shape of each person. For that particular girl I'd say arched. Arched for Western women, straight for Eastern women. Arched of course it looks more defined in my opinion. I think most guys would agree that it highly depends on the rest of the face, so just keep it natural. Sligthly arched like Megan's though I think it all depends on your natural ones. The ones God gave you! God's work is on fleek! I like arched on girls. More stylish that way. Mine have a natural arch. Just use what you were born with. Home > Fashion & Beauty > Arched or straight eyebrows? What looks better in your opinion?